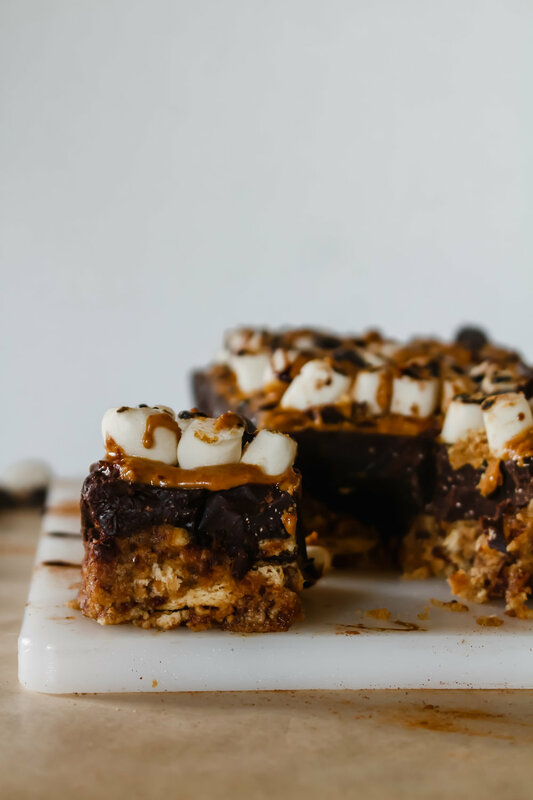 Only 8 ingredients needed for these bars and if you're like me, then you might even have them on hand at all times. That's the best case scenario because I know all too well the feeling that I get when I really want to make a recipe but didn't prepare ahead of time and don't have the ingredients to make it. Ahhh, the struggle. Sending good vibes to you as you read this hoping that you have everything you need in your pantry to get this into your mouth asap. Oh, and an extra little tip if you're feeling fancy - you can toast the little marshmallows on top for bonus points. Trust me, it's worth it. Line a 8.5x5" pan with parchment paper. Set aside. Blend together graham cracker sheets, dates, and hot water together; starting with 1/4 cup of water and slowly adding depending on texture. You want the mixture to easily mold together. Press mixture into pan and place in freezer while mixing the chocolate. Melt the dark chocolate and then stir in the coconut oil and almond butter until fully incorporated. Remove pan from freezer and pour mixture over the graham cracker base. Place back in freezer to set up for 3-4 hours. Remove from freezer and top with peanut butter, mini marshmallows, graham cracker crumble and whatever else you desire. Serve, enjoy! Store in refrigerator for up to 7 days or a few weeks in the freezer.